The mass participation RideLondon-Surrey 100 on Sunday starts in Queen Elizabeth Olympic Park, then follows a 100-mile route on closed roads through the capital and into Surrey's countryside. There are many varied reasons why people are taking part in this cycle ride, and many varied stories behind the people who are taking part. 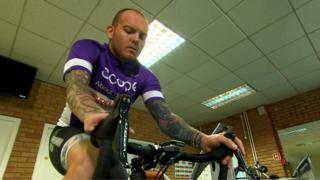 Craig Green is cycling for disability charity, Scope. After years of feeling like he had to prove that he was "normal", sometimes to his detriment, Craig started to get an appreciation for his disability - a condition called Poland Syndrome. Watching the 2012 Paralympic Games had a humbling effect on him, and he's been cycling ever since in the hope of making Team GB in 2016. Read more from Craig, and hear other inspirational stories from some of the people who will be riding on Sunday, 2 August.